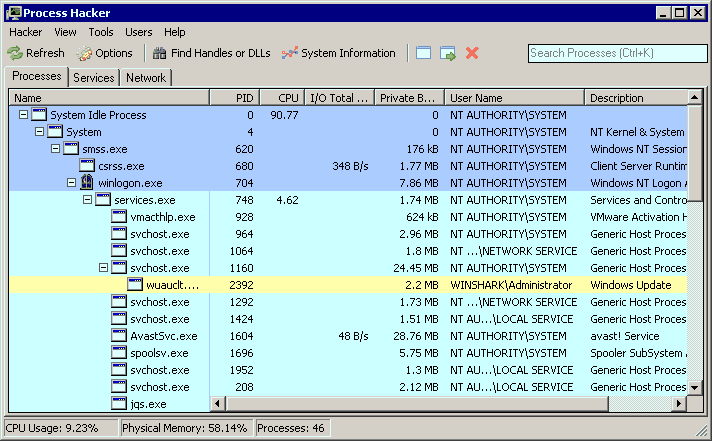 Process Hacker is a feature-packed tool for manipulating processes and services on your computer. Includes a simple, customized tree view, detailed performance graphs, list of network connections, comprehensive process list (including hidden), full control over processes, rootkit termination, and DLL controls. Alternatively, Process Hacker Portable is stealth. Writes settings to: Settings location is specified by passing the -settings parameter to Process Hacker, together with the full path to the settings file. It's a great app, I personally prefer it over Process Explorer. I added a link to Process Hacker Portable. btw the link for the BAT launcher seems to be broken. Please note it for this app in the description. http://portableapps.com got v.2.34, and its Stealth. The UPDATE function is a plugin in folder /plugin, called Updater.dll. You configure it through hacker/plugins. If You ever not gonna update, just delete Updater.dll. Love the "Disk" tab -- frequently when there's a computer slowdown and it's clearly not a processor issue, it's because the hard drive is read/writing some crazy amount of data from antivirus to some background maintenance. Very useful to see what's going on under the hood. and make it more professional app. how does this compare to System Explorer? I think this is getting very close to becoming a 'Process Explorer' replacement! @juvera, clicking that opens a browser window and it works for me in the latest version. I just downloaded the tool, ran the tool, and because I was just curious, I clicked on "About", and in this popup I clicked on "silk icons". - I cannot even unload it from the memory (task manager / end process does not work. Does any know where te program leaves reg entry, if I don't delete kph.sys dreiver? And what is peview.exe for? @Ralph: No, it wasn't. In case of Process Hacker, 2.12 is higher version number than 2.4.
now in Feb2011 I see 2.11 and then 2.12.
wj32, I wish there was an easier way to remove the driver. I want to use the driver version but then remove it from the system when I'm done. ".NET Framework is NOT required." The pre-2.x versions required .NET I believe. This one does not. A rootkit is not obliged to hide itself or any processes. See Wikipedia for more information. "full control over processes, rootkit termination, and DLL controls." The definition of a rootkit is the OS is unaware of its presence because the rootkit *is* the OS at that point, and it won't let you see it's process so you can wack it.